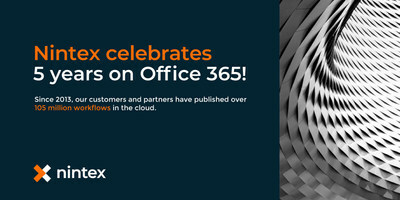 BELLEVUE, Wash., Sept. 17, 2018 /PRNewswire/ -- Nintex today is celebrating the worldwide success its partners and customers report with Nintex for Office 365. Public and private sector organizations have executed more than 105 million workflows since Nintex took its workflow automation platform to the cloud five years ago. "Nintex for Office 365 took the investments we made in our highly-regarded Nintex for SharePoint platform and brought our powerful and easy to use workflow automation and forms capabilities to the cloud," says Nintex CEO Eric Johnson. "We're thrilled to see the market momentum around all of Nintex's current cloud offerings. Our focus is on helping IT, Operations and all business leaders manage and automate their business processes with Nintex no-code solutions." Nintex Workflow and Nintex Forms for Office 365 make it fast and easy to automate simple to sophisticated business processes. Eliminating paper-based forms saves valuable time to help staff focus on more meaningful work. Based on Forrester Research's "The Total Economic Impact of the Nintex Workflow Platform" Study, end users save an average of 60 minutes for complex processes automated with Nintex. Organizations like Fulton County Schools in Atlanta, Georgia, report immediate productivity savings with Nintex for Office 365. The school district, which serves nearly 100,000 students attending more than 100 schools, has turned to Nintex Workflow for Office 365 and Nintex Forms for Office 365 to turn its paper-based and manual processes into efficient digital workflows and forms. "Nintex for Office 365 is a huge part of our digital transformation success at Fulton County Schools," says Coordinator of Enterprise Applications, Anne Sexton. "In fact, as we deliver additional Nintex solutions many more departments are speaking up as they realize the immediate value of what our IT team is doing. Thanks to Nintex we're effectively giving our teachers and staff more time every school day to do what they do best – educate children and turn them into tomorrow's leaders." Elantis Solutions, a Premier Nintex Partner, has also leveraged Nintex for Office 365 since its inception to develop cost-effective customized business process automation and enterprise content management solutions to its customers. "Nintex for Office 365 allows Elantis to provide our customers with affordable solutions for process automation," shares Elantis CEO Dave Roe. "Nintex's intuitive cloud platform offers enhanced digitalization and mobile experiences that were previously difficult to achieve with on-premise tools. Over the past five years, we've delivered significant value to our clients with Nintex workflows, forms and mobile apps and look forward to providing more process automation excellence in the next five years and beyond." Today the Nintex Platform includes capabilities for process mapping and management, modern forms, advanced workflow, document generation, process intelligence and optimization. Later this month, Nintex will showcase these capabilities to attendees of Microsoft Ignite, September 24-28 in Orlando, as well as to attendees of Dreamforce, September 25-28 in San Francisco.